As it turned out, there was a local success when the Smellows pedigree Holstein Friesian herd of Jeremy Taylor, based a few minutes up the road at nearby Small House, Broughton, followed up on its opening January Craven Dairy Auction championship success by repeating the feat at the second show of the year. 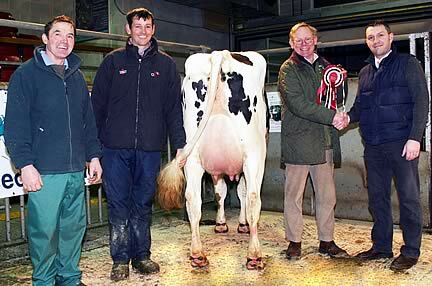 Pictured with the Craven Dairy Auction February champion are, from left, show judge Brian Moorhouse, Smellows herdsman Robert Simpson, exhibitor Jeremy Taylor and BOCM Paul’s Phil Coleman. Mr Taylor achieved back-to-back coups with a home-bred newly calven heifer, Smellows Corio Irene, by his former stock bull, the Picston Shottle son Smellows Coriolanis. Giving 32kg, the 16 days-calved victor is herself out of a VG 86-classified dam who averaged 10,200kg at 4.22% butter fat over her first year’s lactations. The grand dam, Daleview Matt Irene, bred in Lancashire by Richard Parker, of Bleasdale, Garstang, came with similar proven credentials, having produced 110 tonnes of milk over 14 lactations in her lifetime at Small House. Mr Taylor acquired the Daleview herd when rebuilding after foot and mouth. “We got some very good cattle – there is just one old lady left now,” he said. His latest Skipton champion achieved top price in show by some margin when selling for £2,420 to Wilmot Blockley, of WE and O Blockley & Son, Tarvin, Chester, who continues to travel to Skipton to source high performing milkers. The second prize newly calven heifer and reserve champion, a home-bred daughter of the Semex sire, Regancrest Dolman, and giving 30kg, from Skipton regular Peter Baul, of Bishop Thornton, sold for £1,900 to Daniel Reed, of Bielby, York. In fact, Mr Reed left with a 19-strong haul of both newly calven heifers and cows, as he continues to rebuild his commercial dairy herd, first established five years ago, but unable to trade for the past three years, having been caught up in TB restrictions in his part of the world. Mr Reed’s Skipton acquisitions included further prizewinners - the third prize newly calven heifer from Malcolm and Robert Swires, of Haverah Park, Harrogate, at £1,950, from the same vendors the first prize newly calven cow at £1,900, along with the second prize and top price newly calven cow from A Lawson & Son, of Arthington, Otley, at £2,020. The Reed dairy holding has now hit the 240 mark and Mr Reed said he planned to source more quality dairy cattle at Skipton. All his milk goes to Paynes Dairies in Boroughbridge. The remaining prizewinner, the third prize newly calven cow also from the Swiers, made £1,800 when joining ringside regular Wick Williams, of Nantwich, Cheshire. Newly calven heifers sold to an overall average of £1,785 (£1,926 for pedigree entries) and newly calven cows £1,705 (pedigree £1,835). The show was again sponsored by BCOM Pauls and judged by Bell Busk’s Brian Moorhouse.